The newly expanded "Planet Snoopy" Kids Area will arrive Opening Day 2015 on March 28, 2015 along with the rest of California's Great America! The upgrade will bring 3 new rides to the area, further expanding the park's offerings to the Junior Thrillseekers! Gr8Sk8 will be an interactive ride atop Snoopy’s giant skateboard with the feeling of going off the edge. 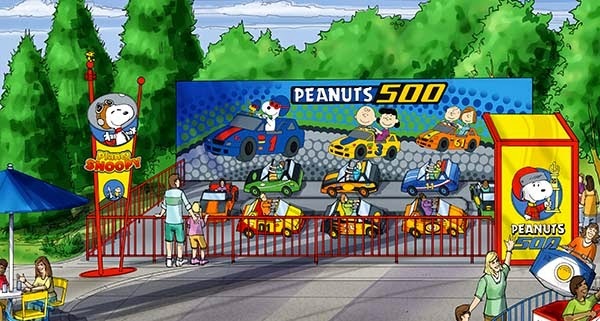 Peanuts 500 lets racers zoom around the track and slingshot around the track’s ends, while Snoopy’s Space Buggies will lift astronauts into the air for a gravity defying lunar landing. Additionally, the park has other new attractions being introduced this year to commemorate its 40 year anniversary. For the entertainment side, the park will introduce a New Stage Show "Celebrating 4 decades of music that'll take guests back to the times". The park will also unveil new food offerings, including a new Starbucks location. To top off the offerings, the park will also extend its operating hours this season, giving guests even more time to experience what the park has to offer. That's all for now from TPO. Make sure to "LIKE" our Facebook page to have the latest in Amusement Park news sent straight to your newsfeed! www.Facebook.com/ThemeParkOverload My name's Nicholous, and Thanks for Reading!